Operations provides the day-to-day . Weekly meetings, call logs, schedules, forms, and contracts, sales goals and quotas – these are all part of the sales operations for a company. This pillar provides a framework within which the sales team can function. A well-designed sales operation helps the teamwork at maximum efficiency, letting salespeople spend as much time as possible doing actual selling. At the same time, it should provide the necessary data to track each . A poorly designed sales operation bogs the sales team down in endless reams of paperwork and while failing to provide a means of tracking their performance. The is the specific A-to-Z approach that the sales team takes to close a sale. It starts from the moment they open a lead list and ends either with a successful sale or with abandoning the attempt to sell to that particular person or business. Some companies have sales processes that continue even after a sale is closed, to cover how salespeople handle existing customers. A good sales process provides a clear, defined path for each salesperson to take yet has enough flexibility to allow for some improvisation. It's a roadmap that allows the sales team to secure as many prospects as possible. 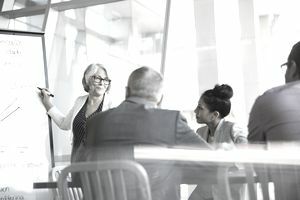 A poor sales process is an impediment to the team, requiring them to take unnecessary steps or simply leaving each salesperson to make up his or her own process. The is usually responsible for coaching her sales team. Coaching is the process of keeping a close eye on each salesperson to see how they are doing from day to day and week to week. A salesperson who is struggling can turn to the coach for help and guidance. One who is doing well can expect praise and rewards from the sales coach. A good sales coach is on top of the performance data gathered by the sales operation and uses it to detect problems. She talks with her salespeople on a regular basis, whether or not they are having trouble. She knows what assistance to offer and when a particular salesperson simply isn't cutting it and needs to be removed from the team. And she is lavish and public in her praise of salespeople whose performance goes above and beyond. A poor either leaves her team floundering, or takes the opposite approach by putting them under a microscope and monitoring their every second, giving them the impression she doesn't trust them. Every salesperson, from the guru who's been in the business for decades to the brand-new rep who was hired last week, must keep learning and growing to be effective. A plan, usually executed by the sales manager, is an essential tool for keeping the team up to date and offering them new and different ways to sell. The market is constantly changing and salespeople must keep up with those changes. Often a company's product offerings shift over time, meaning salespeople need to be informed of those changes and understand what they mean for the customer.